Manufactured and to the highest standards, our sliding industrial doors look and operate exactly how they should. Industrial bi-folding doors, supplied and installed by our team. Our doors provide security and ease of access. High quality, efficent & durable hangar doors, supplied and installed by our team. 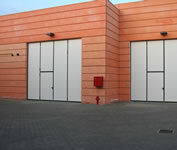 Direct Industrial Doors has vast experience in all forms of bi-folding, sliding and hangar doors. We offer a selection of specialised insulated sliding folding doors, ideal for a multitude of industrial applications. Quickly and easily installed to keep installation costs down, our bi-folding doors are a high quality product available at a competitive price. Hangar doors are the most frequently used part of any aircraft building. The doors you choose to add to your hangar need to be of the highest quality, to ensure maximum eficiency and durability. easy the doors are to install. 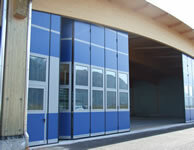 insulated bi-folding, sliding industrial doors in Europe. aircraft hangars or buildings which dispatch and receive goods regularly. Competitive prices on new doors and spare parts. We're looking for trade industrial door companies, visit our contact page.